In case you haven't guessed, I'm on a bit of a shrub kick. I can't seem to get enough of the these amazing drinking vinegars once the weather gets hot and sticky. When poured over ice and topped off with some sparkling water, I'm hard pressed to find anything more refreshing (aside from plain ice water). So, when I found out that this month's Progressive Eats theme was "summer bounty", my brain immediately started scanning the fruit, berries, and herbs that I'd been stocking up on this past week. I found some incredibly plump, sweet blueberries last week, so I knew those would be my base. Our local lavender farm started its U-pick hours this past weekend and well, berries and lavender are basically a match made in heaven (these Blackberry Lavender Popsicles are one of the best things on earth). So yeah, blueberry lavender shrub syrup it was! Shrub syrups also make interesting, flavorful throwback-style cocktails, and this one in particular was amazing with Citadel Aged Gin, a splash of club soda, and a lemon twist (garnished with a sprig of fresh lavender). 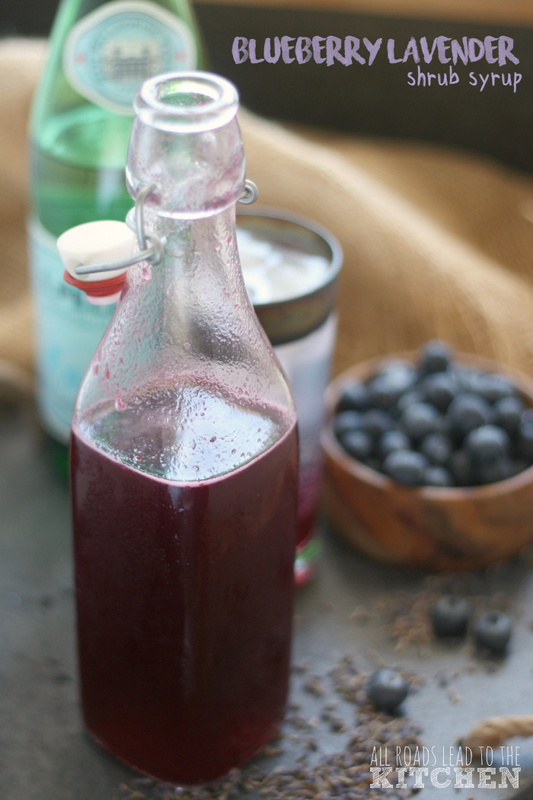 It also shakes up a flavorful vinaigrette for a grilled chicken and blueberry salad. You can use fresh or dried culinary grade lavender flowers in this recipe, whichever you can get your hands on. 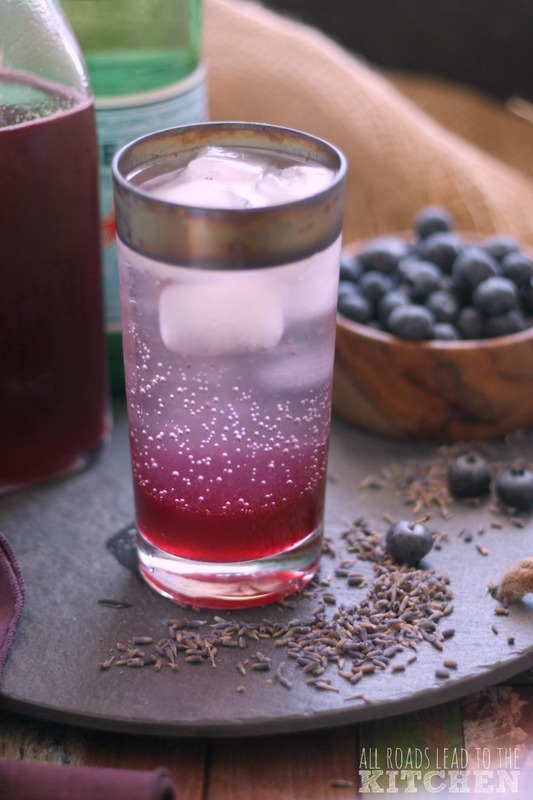 Add this blueberry lavender drinking vinegar to a glass of sparkling water for a refreshing summer drink! Also makes a great signature cocktail. 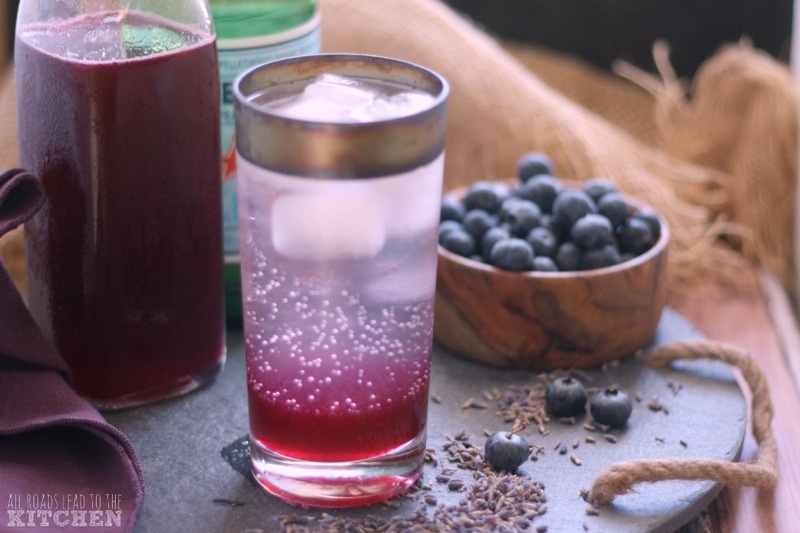 Combine blueberries, sugar, and lavender in a quart-size jar; use a muddler or wooden spoon to smash and smoosh everything together until the sugar looks like wet sand. Pour in the vinegar, put the lid on, and give it a shake. Store the jar in the fridge or in a cool, dark spot for 3-4 days, shaking gently every once in a while. Set a small strainer over another jar and strain the mixture into the clean jar; discard solids. At this point, the shrub syrup is ready, but you can store in covered in the fridge. Stir a couple of tablespoons into a glass of club soda or sparkling water over ice. Stir into lemonade or iced tea. 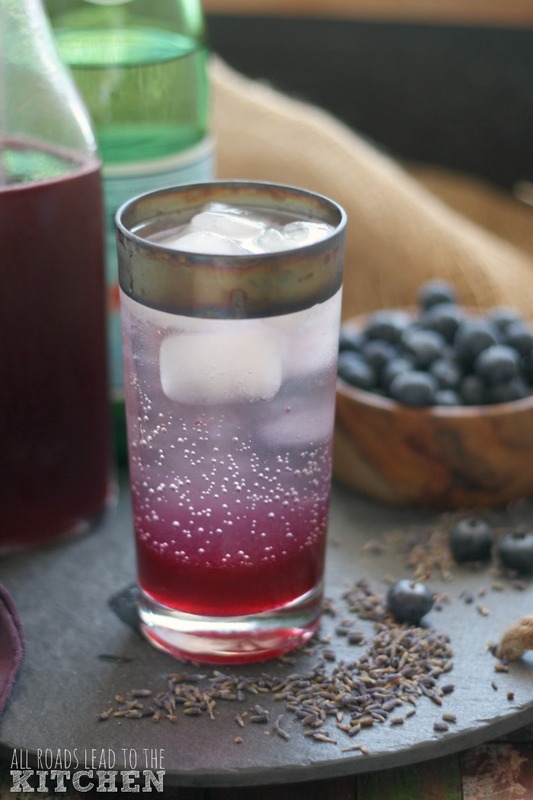 Stir into sparkling wine or combine with booze to make a signature cocktail. Use as a flavor base in a vinaigrette. Welcome to Progressive Eats, our virtual version of a Progressive Dinner Party. This month we're featuring Summer Bounty, hosted by Laura Kumin, who blogs at Mother Would Know. Our theme features fresh vegetables, herbs, and fruits associated with summer in a menu that we hope you'll enjoy! 5 Foods to Complement Your Coffee! 12 Popsicles Recipes to Kick-Off Summer!